Welcome to ‘Living Your Best Financial Life.’Join us each month as we take a look at a different life stage and give you advice on what you can do to help live your best financial life. 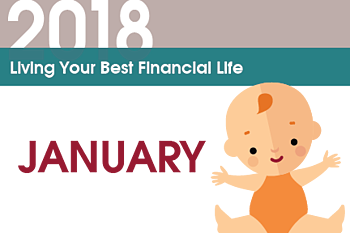 This month, we'll focus on important financial moves for a new baby. Once your bundle of joy comes into the world, it’s important to add them to your insurance policy. To do this, you will need to contact your provider directly to let them know about your new addition. As a new parent, you qualify for a special enrollment period for this purpose. Make sure you have copies of the hospital records and birth certificate in case your provider needs it. This process usually needs to be done within 30 days of the child’s birthdate but some employer’s plans allow for 60. If you already have a will in place, you’ll want to add your new child to your list of beneficiaries as well as any guardianship arrangements that you have in place. If you don’t have a will, having a baby is the perfect time to write one. This will help ensure that your family is taken care of if something happens to you. It’s no secret that college is expensive, but the earlier you start saving, the less of a burden it can be. In the state of Utah, you can open a 529 Savings Plan. You can also open a Dream CD with Cyprus Credit Union. These accounts feature a higher interest rate than a regular savings account and you can continue to contribute throughout the account’s term. If both parents work, now is the time to budget for and plan childcare. This could mean hiring a nanny or arranging daycare. The sooner this is done, even before the child is born, the better. Programs tend to fill up quickly and you don’t want to be stuck on a waiting list or still in the hiring process of a nanny when it’s time to go back to work.